During certain times of the year, when fire danger is lower, residential debris burning of dead vegetation is allowed in many areas. The links below will help you have a safe burning day. When the weather begins to warm up and fire danger increases, all residential debris burning will be restricted. 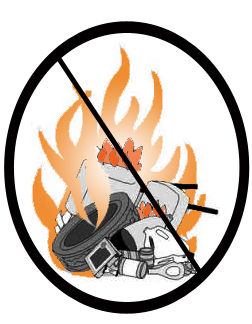 When a burn restriction is in place there is absolutely no debris burning allowed. Only dry, natural, vegetative material such as leaves, pine needles and tree trimmings that originated on the property may be burned. Piles will be no larger than four (4) feet in diameter. 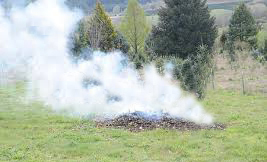 Provide clearance around the pile that is ten (10) feet in diameter by removing all material that will burn, down to bare mineral soil. Have a water source on hand such as a charged garden hose or a minimum of a five (5) gallon backpack, pump type water extinguisher. Responsible adult needs to be in attendance at all times. NEVER burn on windy days. Use this Burn permit link to apply for a permit and read the rules and regulations on burning. For most individuals you will want the standard burn permit. For burn day status call 1-866-287-6329. Call before you burn to make sure it is a burn day where you live! !